Have you made Bisquick Mix? 1. 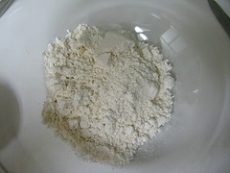 Combine flour, baking powder and salt in large bowl. 2. Blend well. Cut shortening into large chunks and add to dry ingredients. 3. Use pastry blender to cut shortening into flour mixture until most of the shortening is in fine particles, like corn meal. This recipe is high in Vitamin E with 23% of your daily recommended intake per serving.